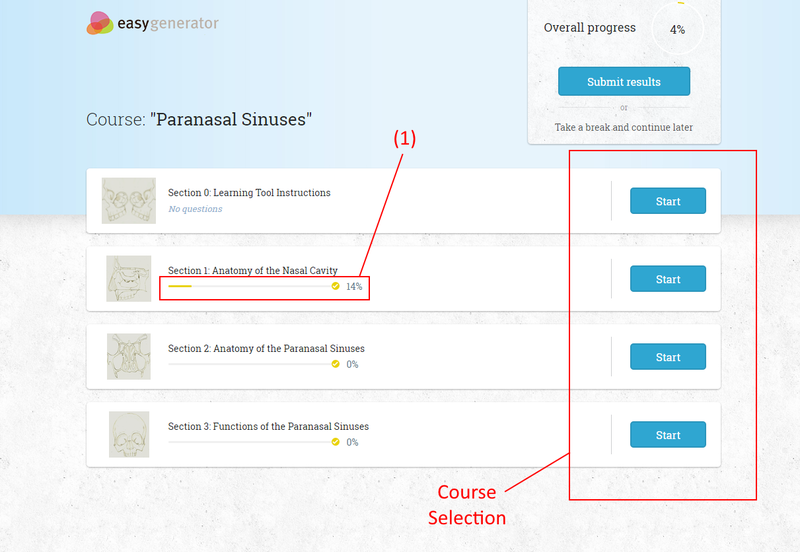 easygenerator | Anatomy Learning Tool: "The Paranasal Sinuses"
Anatomy Learning Tool: "The Paranasal Sinuses"
This learning tool is centred on the topic of the paranasal sinuses. There will be learning content based on the anatomy of the nasal cavity, the anatomy of the paranasal sinuses and the functional anatomy of the sinuses. At the learning tool starting screen, use the "start" buttons on the right hand side to select the appropriate section of this course that you wish to study. In this course there are 4 sections to choose from: "Section 0: Tool Instructions, References and Declarations", "Section 1: Anatomy of the Nasal Cavity", "Section 2: Anatomy of the Paranasal Sinuses" and "Section 3: Functional Anatomy of the Paranasal Sinuses". (1) Progression through each section is monitored, and from the starting screen the overall progress can be seen. Each question section that is correctly answered will contribute to this score and will only reach 100% once all questions in that section have been correctly answered. (2) Once you have selected a section to study you will be brought to the first slide of that section. Using the home button labelled in the image below will return you to the starting screen if you wish to visit a new section. (3) On the top right hand conrner (and at the bottom of the page) the current slide you are on is displayed. Using the arrows on either side you can move to other slides and skip the content that you wish to bypass. (4) The information displayed in the white box is the learning notes for this tool. These can vary between information slides (such as the example in the box), images and questions. Bolded words are key terms or concepts that are worth paying attention to and memorizing - they are likely to appear in test sections. (5) Once you reach the end of a content slide, click the "next" button to proceed to the following content slide without having to scroll back towards the arrows at the top (3). You can also use the arrows at the bottom right hand corner to move to the next content slide (3). Below is a question slide, of which there are several utilized in this learning tool. (6) These are "Option selection" questions which require you to fill the blanks with prearranged answers. Clicking on the arrow to the right will reveal a blue menu from which you can pick an appropriate answer. Clicking an answer will collapse the menu and confirm your selection for that question. (7) Once all questions in a question slide have been answered, click on the "submit" button in order to have your answers checked. Remember: The arrows in the bottom right hand corner (3) can be used to ignore question slides if necessary. You can also return to the previous learning notes to revise if the test is proving difficult. (8) This is a "Fill the blank" question. When you see a blank space with a keyboard icon in the left side then you will be prompted to type an answer into the box in order to answer the question. These questions only require 1-2 words to complete the pre-constructed sentence. (9) This is a "multiple choice" question. From the answers displayed below, clicking on the box to the left will confirm that selection by displaying a tick. Select all the answers that appear to answer the question correctly. 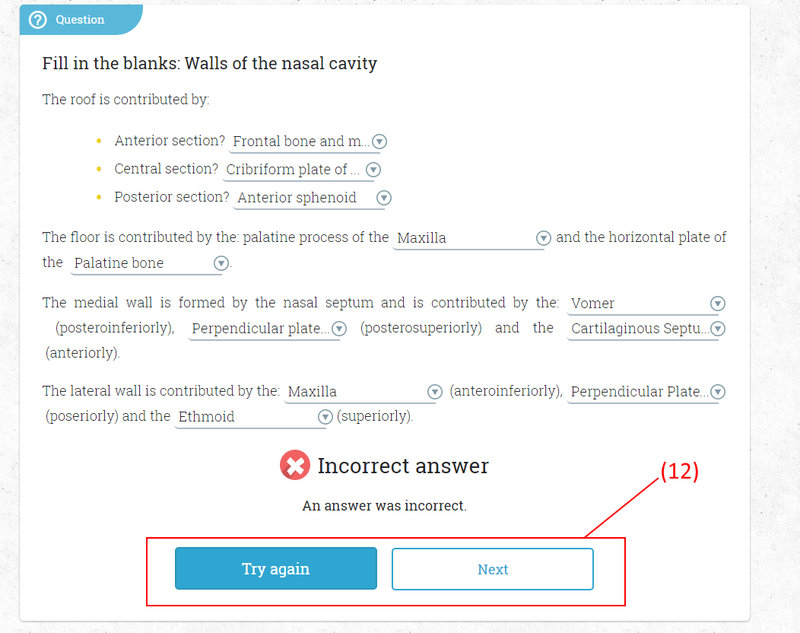 Selected answers can be unselected by clicking a second time. (10) This is a "true or false" question. Similar to the example above in (9), selecting the appropriate empty circle will change the selection to display a blue ring. Clicking on the other empty circle will change your selection should you need to change an answer. The light blue box around the statement will change to a darker blue once an answer has been selected. You will be unable to submit your answers until all statements have been labelled true or false. (11) These are "drag and drop" questions. On the right hand side will be a selection of statements within a dark blue puzzle piece. Clicking and dragging these statements will allow you to move them into the "drop here" box - where they will stick to the original statement in the pale boxes on the left. Join together the puzzle pieces which complete the original statements displayed on the left hand side. The final question type is the open answer question (see the image below). 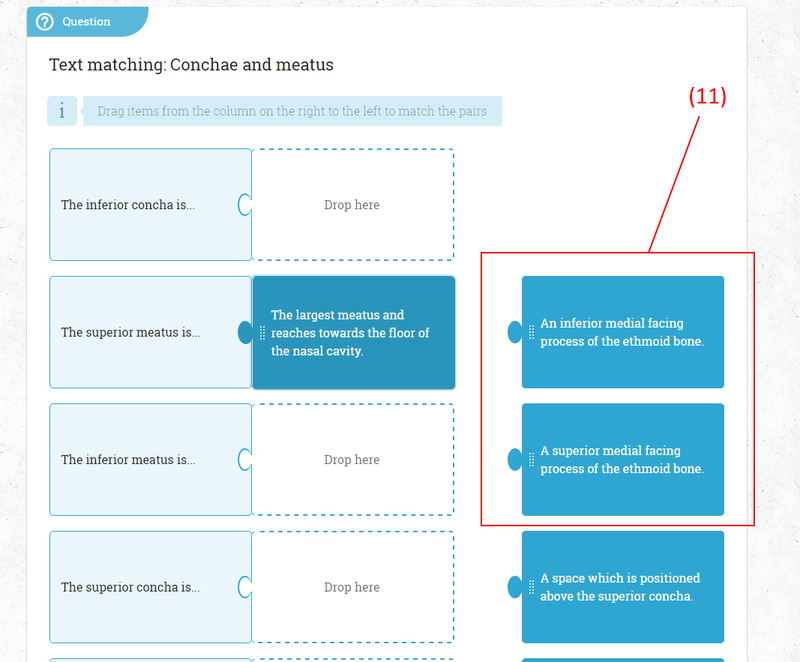 These are extended questions which require you to type a short answer into the provided box (highlighted in red). These questions can be submitted but will not be marked by the learning tool. These questions are present to aid in consolidation of the information provided through discussion of a topic from the learning section. One open answer question concludes each section of this tool. These are all the questions available in this learning tool. 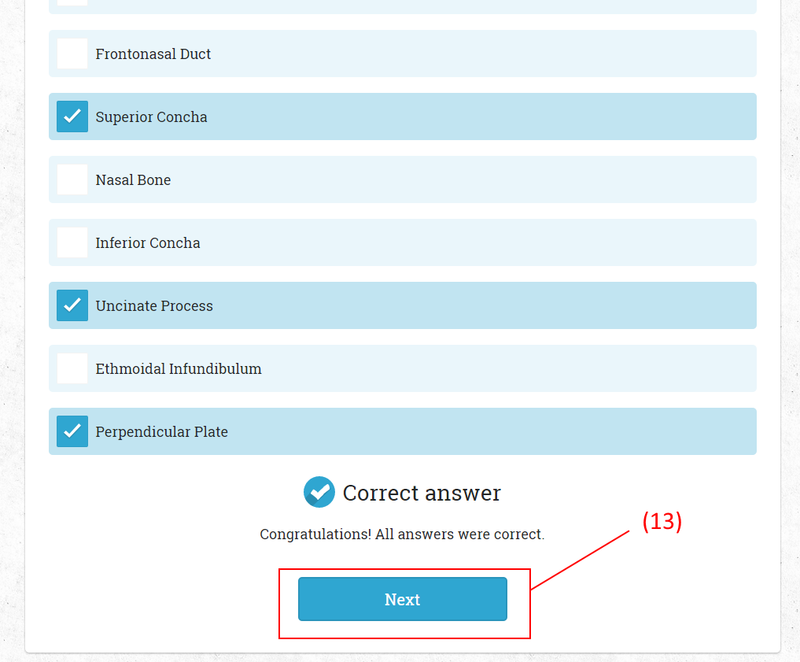 (12) Once a question section has been completed and you have selected the "Submit" button (7), if you have made an error you will be presented with the screen below. Click "try again" if you wish to reset the question (Note: Clicking "try again" will erase all the answers you submitted and cannot be undone). However, if you wish to move onto the next content section click "Next". (13) If you answer all the questions correctly in a question, you will be presented with this screen. Clicking "next" will take you to the next content section and your progress will be recorded on that starting screen of this learning tool (1). (14) Finally, once you have reached the end of an entire section you will be presented with the "home" button. Clicking this will return you to the starting screen and you will be able to select the next section you wish to start. This tool was designed with interaction in mind and as such contains extensive question elements. After each explanatory section, you will be challenged to a short question on that topic. Towards the end of a learning section, you will be given a summary slide. This summary slide contains all the most relevant points from the content slide and prepares you for the short quiz at the end. These quizzes only contain 3-4 questions and conclude with an open question. This concludes the instructions for this learning tool. Good luck! Define and describe the anatomy of the nasal cavity. Define and describe the anatomy of the paranasal sinuses. Understand and describe the functions of the paranasal sinuses. Biggs NL, Blanton PL. The Role of Paranasal Sinuses as Weight Reducers of the Head Determined by Electromyography of Postural Neck Muscles. Journal of Biomechanics. 1970. 3(3): 255-262. Fraederich M, Aboelhasan MF, Knips J, Heiland M, Friedrich RE. Nasal Speech Associated with Hyperaeration of the Sphenoid Sinus. 2015. 29(2): 281-287. Haight JS, Djupesland PG, Qjan W, Chatkin JM, Furlott H, Irish J, Witterick I, McClean P, Fenton RS, Hoffstein V, Zamel N. Does Nasal Nitric Oxide come from the Sinuses? Journal of Otolaryngology. 1999. 28(4): 197-204. Jones N. The Nose and Paranasal Sinuses Physiology and Anatomy. Advanced Drug Delivery Reviews. 2001. 51(1-3): 5-19. Keir J. Why do we have Paranasal Sinuses? Journal of Laryngology and Otology. 2009. 123(1): 4-8. Kellman RM, Schmidt C. The Paranasal Sinuses as a Protective Crumple Zone for the Orbit. Laryngoscope. 2009. 119(9): 1682-1690. Levine H, Clemente MP. Sinus Surgery: Endoscopic and Microscopic Approaches. 2005. New York: Thieme. Lundberg JO. Nitric Oxide and the Paranasal Sinuses. Anatomical Record. 2008. 291(11): 1479-1484. Manson PN, Hoopes JE, Su CT. Structural Pillars of the Facial Skeleton: An Approach to the Management of Le Fort Fractures. Plastic and Reconstructive Surgery. 1980. 66(1): 54-62. Mitchell AWM, Vogl AW, Drake R. Gray’s Anatomy for Students. 2nd Edition. 2009. Philadelphia: Churchill Livingstone/Elsevier. Schaeffer JP. The Nose, the Paranasal Sinuses, Nasolachrymal Passageways and Olfactory Organ in Man. 1920. Philadelphia: Blakiston. Standring S. Gray’s Anatomy: The Anatomical Basis of Clinical Practice. 40th Edition. 2008. Edinburgh: Churchhill Livingstone. Ungor C, Saridogan C, Yilmaz M, Tosun E, Senel FC, Icten O. An Acoustical Analysis of the Effects of Maxillary Sinus Augmentation on Voice Quality. Oral Surgery, Oral Medicine, Oral Pathology and Oral Radiology. 2013. 115(2): 175-184. Zinreich SJ. Functional Anatomy and Computed Tomography Imaging of the Paranasal Sinuses. American Journal of the Medical Sciences. 1998. 316(1): 2-12. All images in this learning tool were hand drawn and edited by the author. All content sections and questions were written and created by the author. The nasal cavity (or nasal fossa) forms the uppermost part of the respiratory tract. It is an irregular air-filled space between the cranial base and roof of the mouth. The nasal cavity is involved in olfaction, temperature adjustment, control of humidity levels of respired air and trapping particulate matter for elimination. The cavity is trapezoid shaped and is widest at its base. It is divided into two separate cavities by the nasal septum, an osseocartilaginous structure which runs medially through the cavity on a longitudinal axis. The nasal cavities open at the anterior apertures, which are the naris of the external nose. The posterior apertures are the choanae which open into the nasopharynx. Figure 1 depicts that nasal cavity. 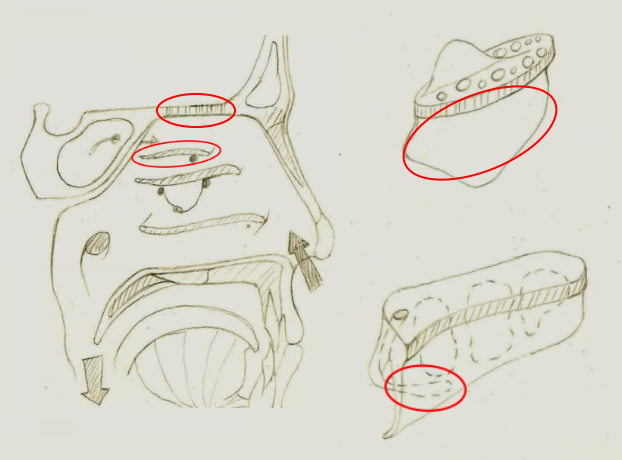 Figure 1 - The nasal cavity, labels indicate the location of the anterior (nares) and posterior apertures (choanae). The nasal cavity is separated from other cavities by the: nasal septum (from one another), the hard palate (from the oral cavity), and parts of the frontal, ethmoid and sphenoid (from the cranial cavity). Figure 2 shows the components separating the nasal cavity from other cavities. 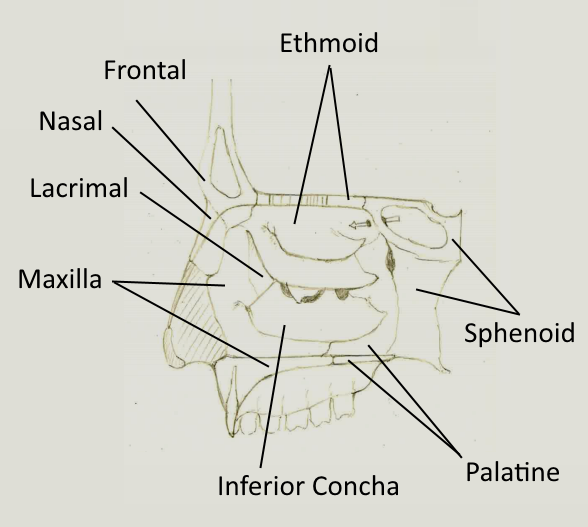 The skeletal framework of the nasal cavity is primarily composed of the unpaired ethmoid, sphenoid, frontal bone and vomer with the paired nasal, maxillary, palatine, lacrimal and inferior concha. Figure 2 - Isometric nasal cavity view indicating air flow (arrows) and the nasal septum (left image). Median sagittal view of the nasal cavity demonstrating features separating the cavities. The nasal cavity is the part of the respiratory tract. The nasal cavity is important for: , adjustment, and levels of respired air. What are the anterior apertures of the nasal cavity? 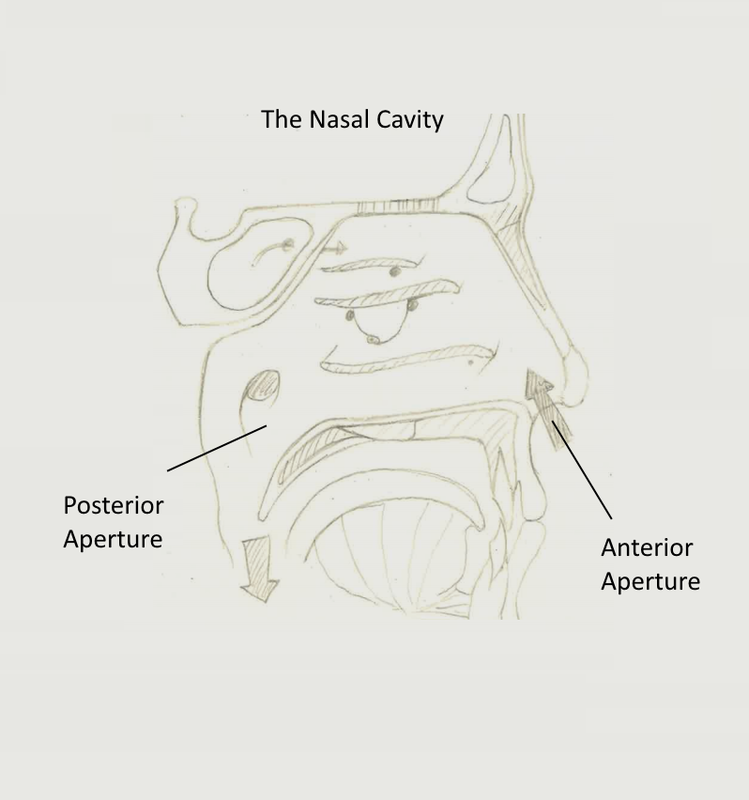 What are the posterior apertures of the nasal cavity? . What separates the nasal cavity from the oral cavity? . Which shape does the nasal cavity form? . What divides the nasal cavity into two separate cavities? . As previously mentioned, the nasal cavity is separated from other cavities by different anatomical structures. This section will describe the walls of the nasal cavity. The roof is aligned horizontally at the centre of the cavity and begins to slope inferiorly at the anterior and posterior aspects. The anterior section is formed by the nasal and frontal bones. 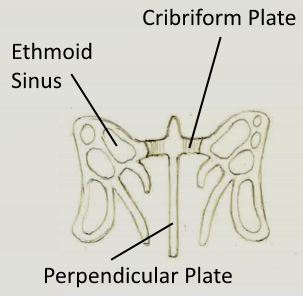 The central section is formed by the cribriform plate of the ethmoid. The posterior section is formed by the anterior aspect of the sphenoid (figure 3). The floor of the nasal cavity is concave, sloping slightly superiorly at the anterior and posterior apertures. It is formed by the palatine process of the maxillae articulating posteriorly with the horizontal plate of the palatine bone. Figure 3 - Nasal cavity labelled with the roof and floor components. Red - posterior roof; Blue - central roof; Green - anterior roof; Orange - floor with curvature. The medial wall is formed by the osseocartilaginous nasal septum running vertically along the midline from the roof to floor of the cavity (figure 4). The posterior part of the septum is primarily osseous with the anterior being cartilaginous. The posteroinferior aspect of the bony septum is the vomer, extending from the sphenoid to the palatine bone. The posterosuperior part is formed by the perpendicular plate of the ethmoid. The nasal and frontal bones may also make contributions. The cartilaginous septum's anterosuperior margin is connected to the posterior border of the internasal suture (where the nasal bones fuse). The anteroinferior part is connected to either side of the medial crurae of the greater alar cartilage by fibrous tissue. The cartilagenous septum joins the perpendicular plate of the ethmoid posterosuperiorly and the vomer posteroanteriorly. The section of nasal septum between the nares lacks cartilage and is instead called the membranous septum. The lateral wall is formed anteriorly by the maxilla, posteriorly by the perpendicular plate of the palatine bone, and superiorly the ethmoid bone. The lacrimal bone also sits between these plates of bone. The lateral wall will be considered more in the next section (figure 5). Figure 4 - A view of the medial wall of the nasal cavity. The main contributors towards the nasal septum have been labelled. The greater alar cartilage is also shown. Figure 5 - The main components of the lateral wall of the nasal cavity. Note that the inferior concha is an independent piece of bone. Why is the section of the nasal septum between the nares called the membranous septum? 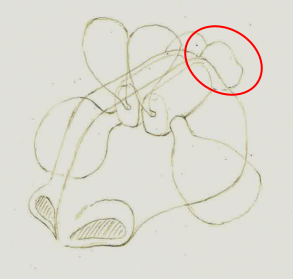 The floor is contributed by the: palatine process of the Palatine boneMaxillaSphenoid and the horizontal plate of the Palatine boneMaxillaSphenoid . The medial wall is formed by the nasal septum and is contributed by the: Perpendicular plate of the EthmoidVomerCartilaginous Septum (posteroinferiorly), Perpendicular plate of the EthmoidVomerCartilaginous Septum (posterosuperiorly) and the Perpendicular plate of the EthmoidVomerCartilaginous Septum (anteriorly). The lateral wall is contributed by the: MaxillaEthmoidPerpendicular Plate of the Palatine Bone (anteroinferiorly), MaxillaEthmoidPerpendicular Plate of the Palatine Bone (poseriorly) and the MaxillaEthmoidPerpendicular Plate of the Palatine Bone (superiorly). 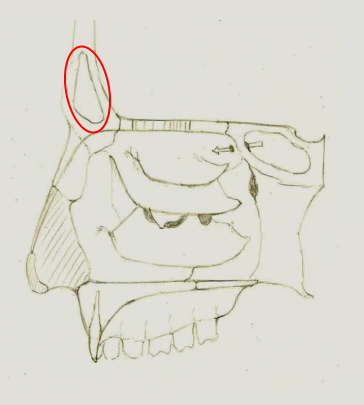 The lateral wall is characterized by the presence of 3 shelves of bone called conchae (figure 6). The conchae all project medially and inferiorly into the nasal cavity. The anterior, posterior and medial margins of each concha are free and they divide the cavity into 4 air canals. The inferior space below each shelf forms an air canal and is termed a meatus which open into the nasal cavity. 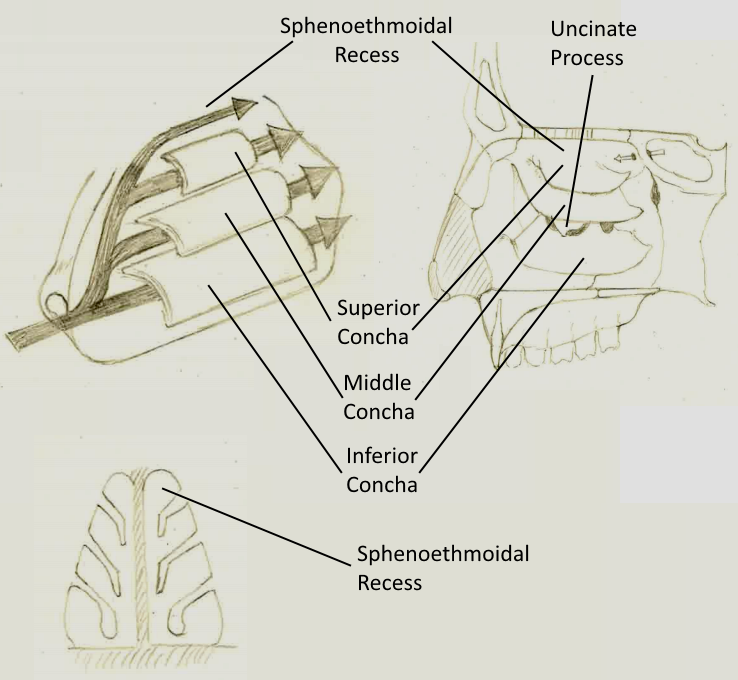 A 4th air canal exists called the sphenoethmoidal recess above the superior concha (figure 7). The middle concha may occasionally be expanded by an air cell which forms a concha bullosa. The function of the conchae are to increase the surface area of contact between tissues and respired air. 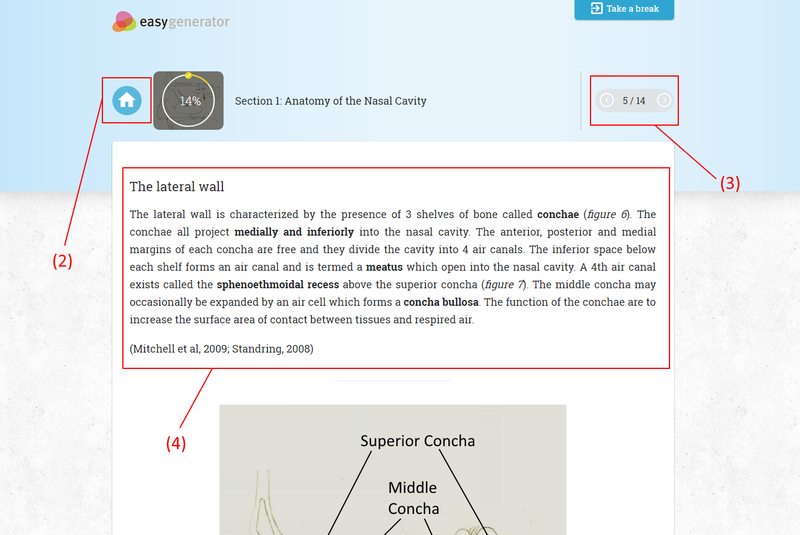 Figure 6 - The concha of the lateral wall of the nasal cavity. Median sagittal view (left) and coronal view (right). Figure 7 - The air channels of the nasal cavity. Notice how each concha isolates the air channels from one another. The ethmoid (figure 8 and 9) is one of the major bones in the nasal cavity, acting as a key stone and making contributions to the roof, lateral and medial walls of both nasal cavities. The ethmoid is cuboid in shape and is composed of two lateral rectangular labyrinths (known as the ethmoidal labyrinths or lateral masses) joined along the midline by a perforated sheet of bone which is the cribriform plate. Each labyrinth contains within it an ethmoid sinus and forms a bony labyrinth on either side of the cribriform plate. 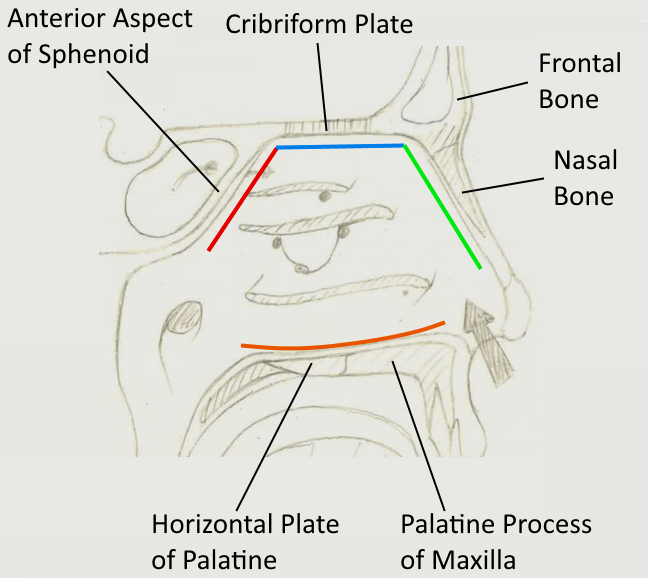 The perpendicular plate descends vertically along the median sagittal plane from the cribriform plate and contributes towards part of the nasal septum. Figure 8 - The ethmoid shown as its separate components and combined. The medial walls of the ethmoid labyrinths produce two processes which are the superior and middle conchae. Extending anterosuperiorly from the superior concha is a grove which is the enthmoidal infundibulum which moves superiorly to form a narrow channel passing through the ethmoidal labyrinth, becoming the frontonasal duct. This duct will eventually pass through the ethmoidal labyrinth and will form a communication with the frontal sinus. On the anterior aspect of the inferior ethmoidal labyrinths there is a bony projection extending posteroinferiorly in the middle meatus which is the uncinate process. 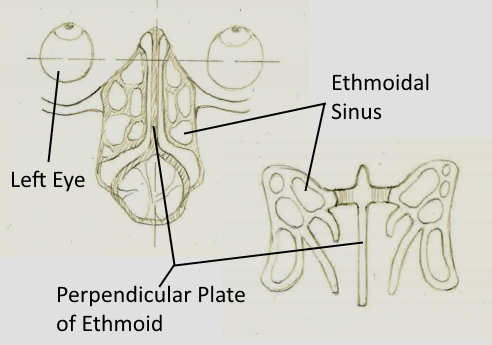 Figure 9 - A coronal view of the ethmoid detailing the perpendicular plate, cribriform plate and ethmoid sinus. 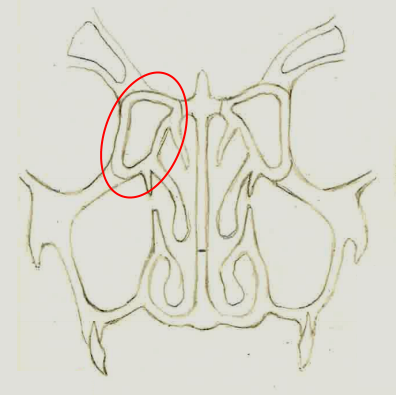 The superior surface of the ethmoid articulates with the frontal bone, with the frontal bone usually contributing towards the roof of the ethmoidal labyrinth. The anterior surface articulates with the frontal process of the maxilla and the lacrimal bone. The inferior surface articulates with the upper medial margin of the maxilla. Study the image above. 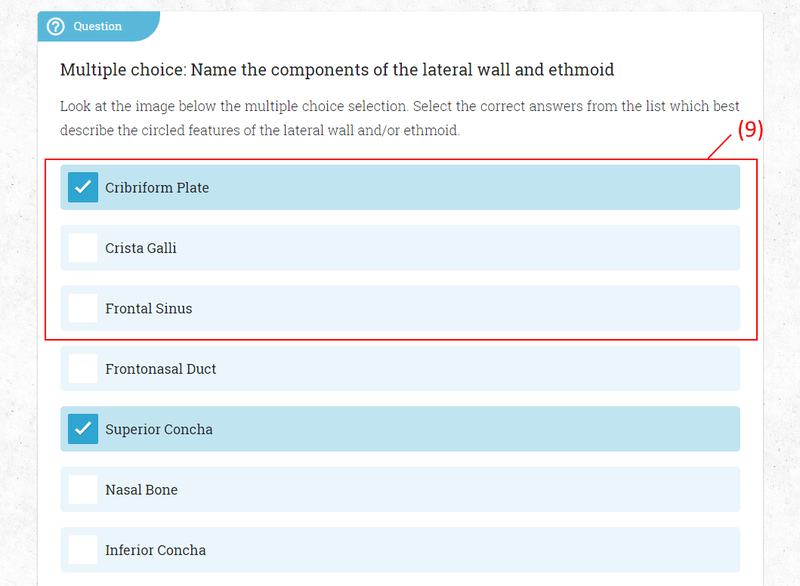 Select the correct answers from the list which best describe the circled features of the lateral wall and/or ethmoid. The superior surface of the ethmoid articulates with the frontal bone only. The anterior surface of the ethmoid articulates with the lacrimal bone only. The inferior surface of the ethmoid articulates with the lower lateral margins of the maxilla only. The frontal bone may contribute towards the roof of the ethmoidal labyrinth. The ethmoid acts as a key stone for the nasal cavity. The perpendicular plate of the ethmoid extends vertically in the median sagittal plane from the cribriform plate and contributes to the nasal septum. The narrow channel extending anterosuperiorly from the superior concha and passing through the ethmoidal labyrinth is the orifice of the maxillary sinus. Look at the following statements below and decide whether they are true or false. 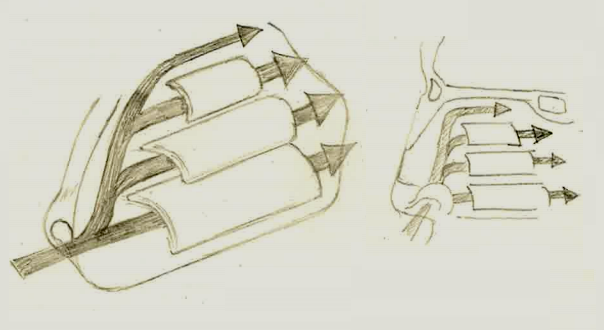 Figure 10 - The air channels of the nasal cavity and a comparison with the anatomy of the lateral wall. The inferior concha is a separate piece of thin bone articulating with the nasal surface of the maxilla and perpendicular plate of palatine. Inferior and lateral to the inferior concha is the inferior meatus which is the largest of the three, reaching towards the floor of the nasal cavity. The nasolacrimal duct is present towards the anterior of the inferior meatus. The middle concha is a medial process of the ethmoidal labyrinth but also articulates with the perpendicular plate of the palatine bone. Inferior and lateral to this concha is the middle meatus. The middle meatus has several important features of the nasal cavity, these being the hiatus semilunaris (figure 11) which is formed by the posterior edge of the uncinate process, which forms the medial limit of the ethmoidal infundibulum (found laterally to the uncinate process). The entrance of the maxillary sinus can also be found inferior to the uncinate process. The orifice of the frontonasal duct or ethmoidal infundibulum can be found at the anterior edge of the uncinate process. 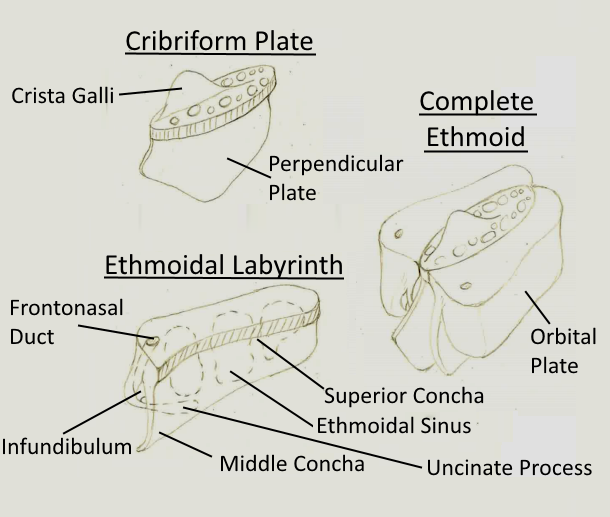 Finally, the superior concha is also a medial process of the ethmoidal labyrinth and is a small curved plate. It is positioned posterosuperior to the middle concha, with the inferior space forming the superior meatus. This meatus is the smallest and shallowest of the three. Above the superior concha is the sphenoethmoidal recess (figure 10). The superior meatus forms a thin and oblique channel. Figure 11 - Important features of the lateral wall, present in the meatus of the nasal cavity. What are the four important features of the middle meatus? Match the incomplete statements on the right hand side with the starting sentences on the left hand side. A separate piece of bone articulating with the nasal surface of the maxilla and perpendicular plate of palatine. An inferior medial facing process of the ethmoid bone. A superior medial facing process of the ethmoid bone. The largest meatus and reaches towards the floor of the nasal cavity. The smallest meatus and form an oblique channel. A space which is positioned above the superior concha. The nasal cavity forms the uppermost part of the respiratory tract. It is important for olfaction, temperature adjustment, humidity and trapping antigens. It is trapezoid in shape. Divided into two cavities by the osseocartilaginous nasal septum. The nares are the anterior openings (external), and the choanae are the posterior openings (nasopharynx). The skeletal framework is primarily the unpaired ethmoid, sphenoid, frontal and vomer bones with the paried nasal, maxillary, palatine, lacrimal bones and inferior concha. The lateral wall is characterized by 3 shelves of bone - the inferior, middle and superior conchae. The conchae project medially into the nasal cavity and have free edges. The conchae divide the nasal cavity into 4 air channels - the inferior, middle, superior meatus and sphenoethmoidal recess. The ethmoid acts like a key stone and contributes to roof, lateral and medial wall of both cavities. It is formed by the cribriform plate with a perpendicular plate projecting infiorly on a horizontal plane. Either side of the cribriform plate are the two ethmoidal labyrinths. The superior and middle conchae projection project posteromedially from the ethmoidal labyrinths. Other features - ethmoidal infundibulum and uncinate process. The ethmoid articulates with the frontal bone, frontal process of the maxilla, lacrimal bone and the maxilla. Inferior concha is a separate bony plate articulating with the maxilla (nasal surface) and perpendicular plate of palatine. Inferior meatus is the largest and reaches towards the nasal cavity floor. Middle concha is a medial process of the ethmoid bone and articulates with the perpendicular plate of palatine. Middle meatus features - hiatus semilunaris (formed by posterior edge of the uncinate process), uncinate process, and ethmoidal infundibulum and/or frontonasal duct (at the anterior edge of the uncinate process). 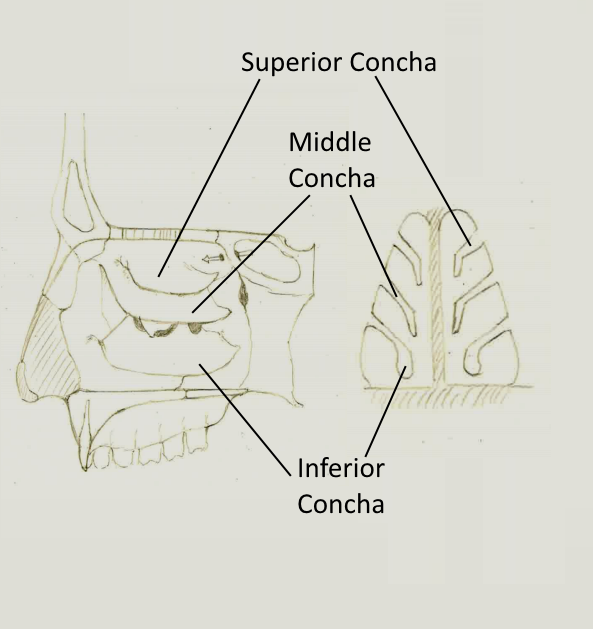 Superior concha is a small medial process of the ethmoid bone. The superior meatus is smallest and shallowest, forming an oblique channel. The sphenethmoidal recess is superior to the superior concha. The anterior component of the nasal cavity roof is contributed by the nasal and frontal bones. The nasal cavity is trapezoid in shape with its roof being the widest. The nares are the anterior apertures and the choanae are the posterior apertures of the nasal cavity. The nasal cavity is divided into 4 air channels by the conchae. The hiatus semilunaris, ethmoidal infundibulum/frontonasal duct and maxillary ostium drain into the medial meatus. The inferior and middle conchae are projections of the ethmoid bone, with the superior concha being a separate piece of bone. The uncinate process is a projection of the sphenoid. 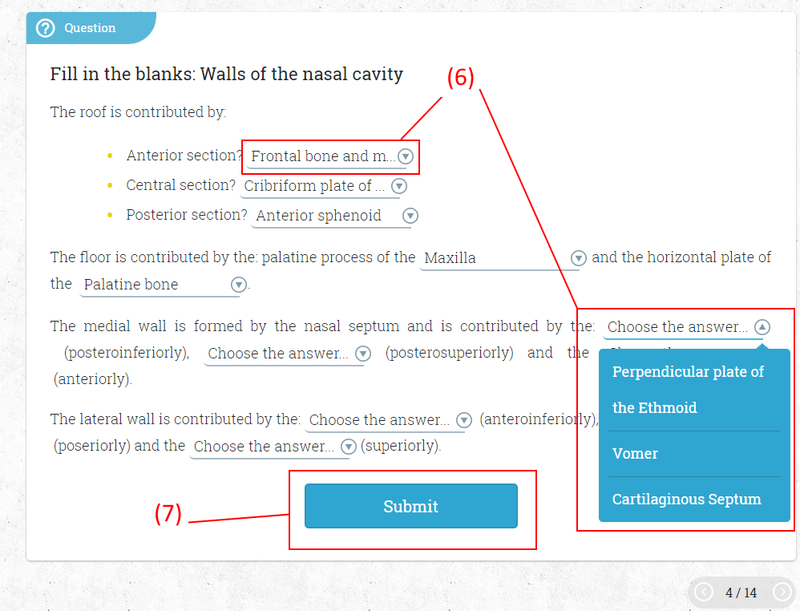 Select the statements which correctly describe the nasal cavity. The sphenoethmoidal recess is above the meatus. The inferior meatus is the smallestlargestneither of the following of the 3. The cribriform plate is a part of which bone? Which 2 bones contribute towards the majority of the osseous nasal septum? and the perpendicular plate of . What is the name of the cartilaginous septum at the greater alar cartilage? The cartilage. 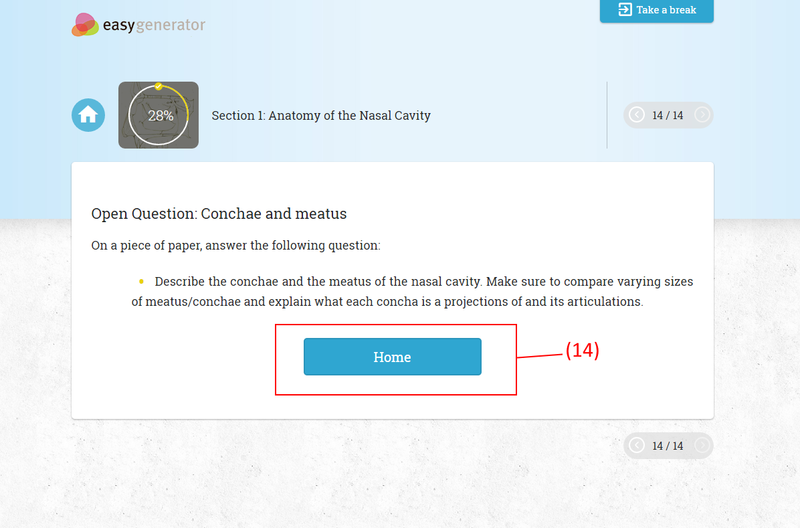 Describe the conchae and the meatus of the nasal cavity. Make sure to compare varying sizes of meatus/conchae and explain what each concha is a projections of and its articulations. The paranasal sinuses (figure 1 and 2) are extensions of the nasal cavity which develop within the surrounding bone during childhood and early adulthood. There are four primary sinuses which are named by the bone they formed within. They are: the ethmoidal sinus, the maxillary sinus, the sphenoidal sinus and the frontal sinus. Each sinus opens into the nasal cavity via a small communication in the lateral wall named the ostium. These communications allow for balance of air, pressure and clearance of mucous through mucociliary escalators. The sinuses are lined by respiratory epithelium (ciliated pseudostratified columnar) which is an extension of the epithelium found in the nasal cavity, however in the sinuses it is thinner, less vascular with fewer goblet cells (mucous secreting cells). The pattern of ciliary flow is specific to each sinus and persists even when extra orifices into the sinuses are surgically added. This flow is directed primarily towards the primary ostium of that sinus. Large variance between individuals pertaining to the communication location, size and shape of the paranasal sinuses exists. The following sections will describe the textbook anatomy of the sinuses and their communications, but it is important to keep in consideration that variation does exist. The paranasal sinuses are all innervated by branches of the trigeminal nerve (cranial nerve V). Figure 1 - The paranasal sinuses in an abstract diagram, detailing the relationships with the other sinuses and the nasal cavity. 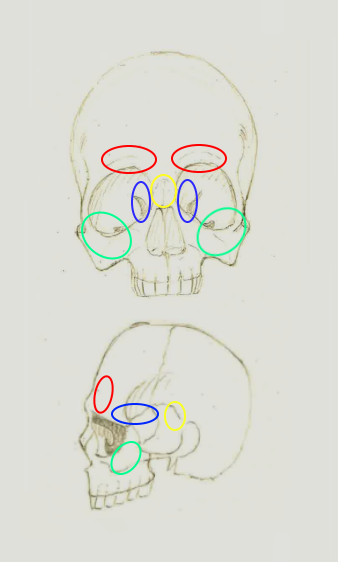 Figure 2 - The locations of the paranasal sinus from external views of the skull. Frontal sinus (red), maxillary sinus (green), ethmoidal sinus (blue) and sphenoidal sinus (yellow). What are the four paranasal sinuses? What is the name of the communications between the nasal cavity and the sinuses? . Which epithelium lines the sinuses? . Which of the following is true for the epithelium lining the paranasal sinuses? More goblet cellsThinnerMore vascularLess cilia . 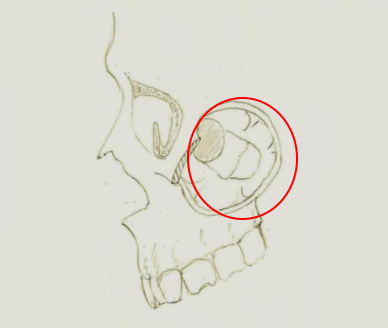 The frontal sinus (figure 3) are the most superior of the sinuses and are positioned posteriorly to the supraorbital ridge of the skull. They can extend above the medial part of the eyebrow and backwards towards the medial roof of the orbit. They are rarely symmetrical due to the septum dividing them frequently deviating from the medial plane. The sinus may be slightly subdivided into an incomplete lattice by thin and incomplete bony septa. In the adult they are averagely 3.2 cm in height, 2.6 cm in depth, and 1.8 cm in breadth. The frontal sinus is most pronounced in males and only reaches full size after puberty. Figure 3 - The frontal sinus from various views of the skull. The view on the left demonstrates the frontal sinus behind the supraorbital ridge of the skull. The frontal sinus drains into the anterior middle meatus via the frontonasal duct into the ethmoidal infundibulum. Arterial supply for the frontal sinus is delivered via the anterior and supraorbital ethmoidal arteries. The veins drain via an anastomotic vein at the supraorbital notch which connects superior opthalmic and supraorbital veins. Lymphatics drain towards the submandibular nodes. The sinuses are innervated by branches of supraorbital nerve (general sensation) from the opthalmic trigeminal branch (V1). Orbital branches of pterygopalatine ganglia provide parasympathetic secretomotor function. They are often symmetrical with a septum that is consistently on the medial plane. The frontal sinus is posterior to the supraorbital ridge of the skull. The frontal sinus cannot be subdivided by incomplete bony septa. The frontal sinus is most pronounced in females. Drains into the meatus via the . Arterial supply is provided by anterior and supraorbital ethmoidalposterior and supraorbital ethmoidalanterior and infraorbital ethmoidalposterior and infraorbital ethmoidal arteries. Veins drain via an vein at the supraorbital notch which connects the superior ophthalmic and infraorbital veinsinferior ophthalmic and infraorbital veinssuperior ophthalmic and supraorbital veinsinferior ophthalmic and supraorbital veins veins. Lymphatics drain towards the maxillarysubmandibularretropharyngeal nodes. General sensation is provided by branches of nerve from the ophthalmic trigeminal branch. Secretomotor function is provided by orbitalnasal branches of pterygopalatine ganglia. The ethmoidal sinus (figure 4) unlike the other sinuses is constructed from many thin-walled chambers, forming the ethmoidal labyrinth either side of the cribriform plate. The ethmoidal sinuses are separated by the orbital cavity by the thin orbital plate. There is a large variance in the number of chambers which can be formed within the sinus. Finally, the sinuses are positioned between the orbits at the superior nasal cavity. Figure 4 - The position of the ethmoid sinus from a transverse plane (left) and the coronal plane (right). Notice that the ethmoid sinuses sit between the orbits and are on the same plane as the eyes. The sinuses are divided into anterior and posterior groups on both sides, with their classification being dependent on which part of the nasal cavity they communicate with. These groups are separated by the basal lamella of the middle concha. The chambers of a group form incomplete septa between one another, allowing communication of air between the cells of a group. 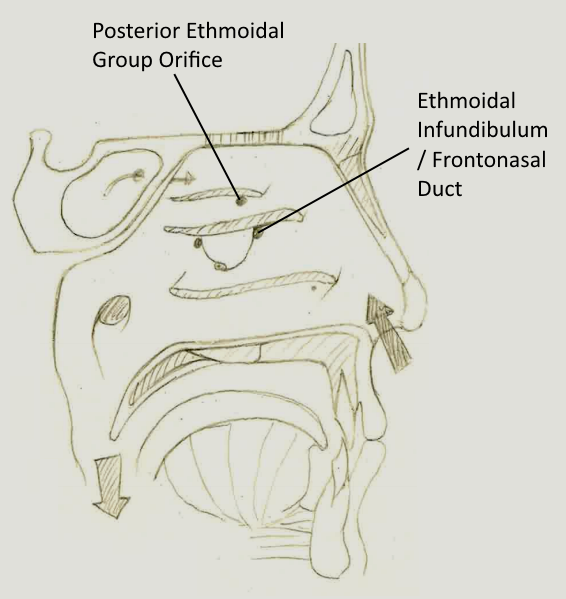 The anterior group drain into the middle meatus either through the ethmoidal infundibulum or the frontonasal duct (figure 5) through one of several orifices. The posterior group drains into the superior meatus usually through a single orifice. The most anterior ethmoidal air cells are termed the agger nasi cells, with their size and numbers varying. Figure 5 - Orifices on lateral wall of the nasal cavity within the middle and superior meatus. Arterial supply of the ethmoidal sinuses is provided by nasal branches of the sphenopalatine artery and the anterior and posterior ethmoidal branches of the ophthalmic artery. Veins draining the sinuses are via corresponding veins. The sinus is innervated for general sensation by the anterior and posterior ethmoidal branches of the ophthalmic nerves. Parasympathetic secretomotor fibres are provided by orbital branches of the pterygopalatine ganglia. Lymphatic drainage is towards submandibular nodes (anterior group) and retropharyngeal nodes (posterior group). The ethmoidal sinuses are constructed of many thin-walled chambers. The ethmoidal sinus are separated from the orbits by the thin cribriform plate. The ethmoidal labyrinths sit either side of the cribriform plate. 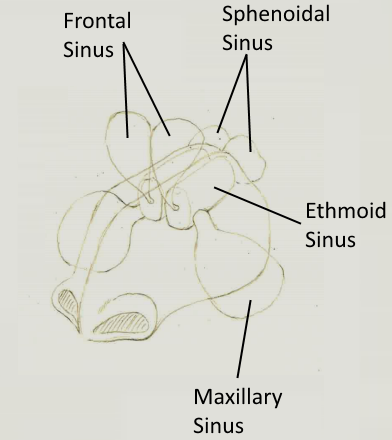 The ethmoidal sinus are divided into lateral and medial groups. The chambers of one group are incomplete and communicate with one another. 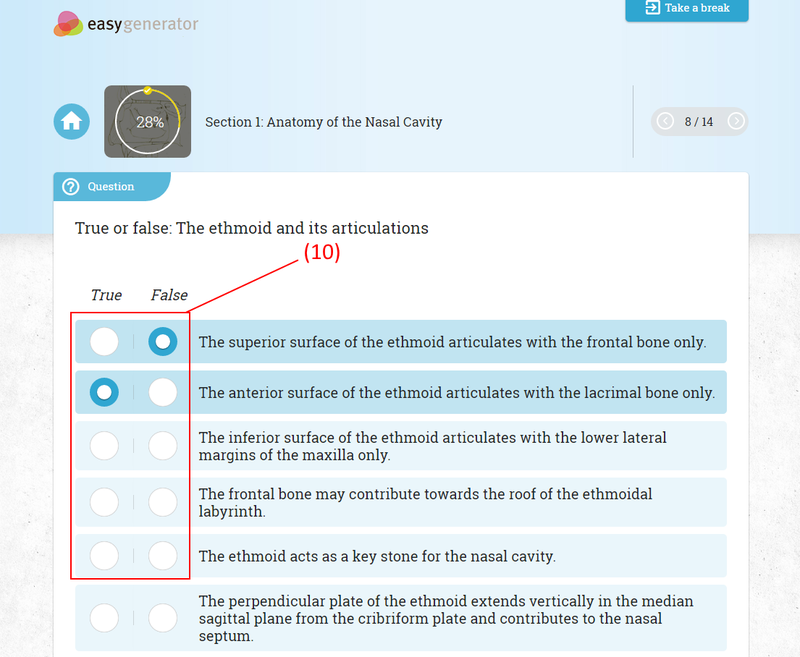 Select all of the statements which accurately describe the ethmoidal sinus. The anterior group drains into the meatus and the posterior group grains into the meatus. Arterial supply is provided by sphenopalatineethmoidalophthalmicnasal branches of the sphenopalatineethmoidalophthalmicnasal artery and the anterior and posterior sphenopalatineethmoidalophthalmicnasal branches of the sphenopalatineethmoidalophthalmicnasal artery. Venous drainage is via corresponding veins. Lymphatics drain towards the maxillarysubmandibularretropharyngeal (anterior group) and maxillarysubmandibularretropharyngeal (posterior group) nodes. General sensation is provided by anterior and posterior branches of the nerves. Secretomotor function is provided by: orbitalnasal branches of the pterygopalatine ganglia. 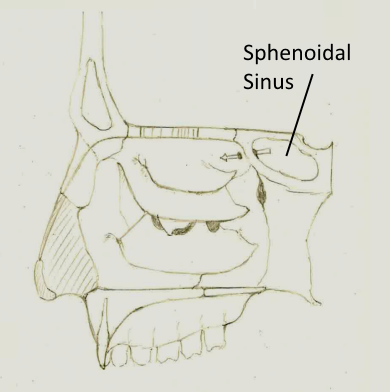 The sphenoidal sinus (figure 6) are 2 large cavities of irregular shape, formed within the body of the sphenoid. They are found in the superoposterior region of the nasal cavity. In the average adult, the sphenoid sinus is 2 cm in height, 2.1 cm in depth and 1.8 cm in breadth. They are frequently divided by a septum which may deviate from the midline and so they are often unequal in volume. These sinuses can occasionally be further subdivided by formation of accessory septa. The sphenoidal sinuses are related to the cranial cavity, optic chiasm and pituirary gland superiorly, the internal carotid artery and cavernous sinuses laterally and nasal cavity inferior and anterior. Figure 6 - The sphenoidal sinus in the medial sagittal view of the nasal cavity. 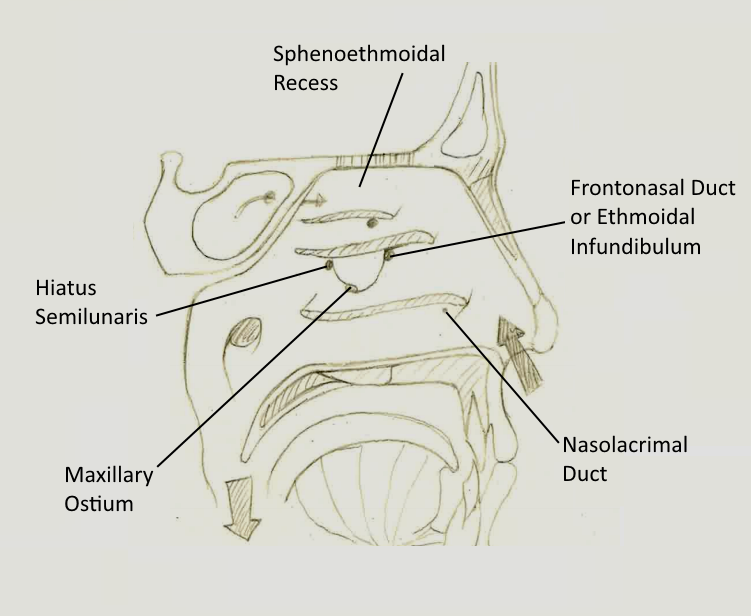 Each sinus communicates with the nasal cavity via an opening in their anterior wall into the sphenoethmoidal recess above the superior concha. The sphenoidal sinus receives blood supply from posterior ethmoidal branches of the ophthalmic arteries and nasal branches of sphenopalatine arteries. The sinuses are drained by posterior ethmoidal veins into superior ophthalmic veins. They receive innervation from posterior ethmoidal branches of ophthalmic nerve (general sensation) and orbital branches of the pterygopalatine ganglion (secretomotor function). Lymphatic drainage of the sinuses is towards the retropharyngeal nodes. 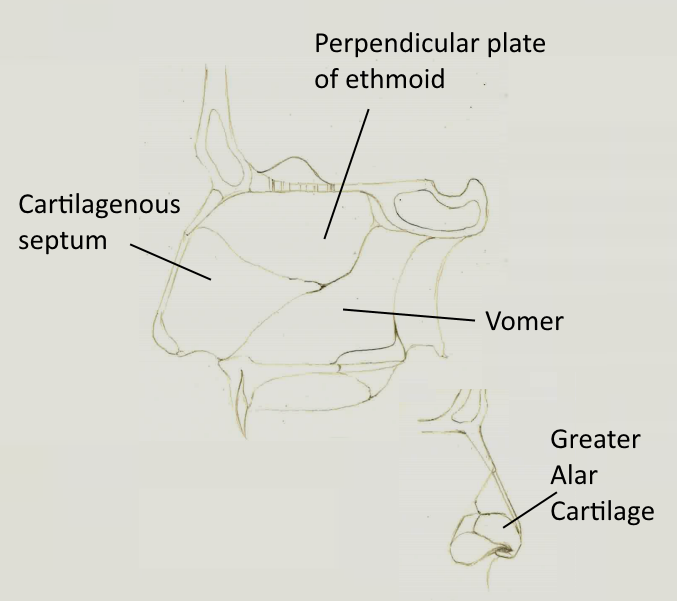 The sphenoid can be found anterior to the ethmoid. 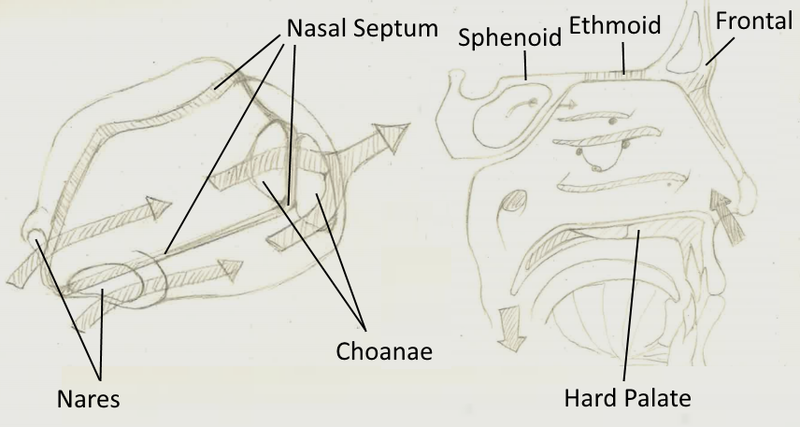 The sphenoidal sinus are typically divided by a septum. The sphenoidal sinus have relations with the pituitary gland superiorly. The sphenoidal sinus have relations with the cavernous sinuses inferiorly. The sphenoidal sinus are frequently divided by accessory septa. Drains into the via an anteriorposteriormediallateral wall above the concha. Arterial supply is provided by posterior nasalophtalmicethmoidalorbital branches of the nasalophtalmicethmoidalorbital arteries and nasalophtalmicethmoidalorbital branches of spheno arteries. Venous drainage is by the posterior nasalophtalmicethmoidalorbital veins into the superior nasalophtalmicethmoidalorbital veins. General sensation is provided by anteriorposterior ethmoidal branches of maxillaryophthalmicnasalsupraorbital nerve. Secretomotor function is provided by orbitalnasal branches of the pterygopalatine ganglia. The maxillary sinus (figure 7) is pyramid shaped, fills the body of the maxilla and is the largest of the paranasal sinuses. The base of the sinus faces medially and forms most of lateral wall of the nasal cavity. The floor of the maxillary sinus is related with the roots of the teeth, in particular the molars and premolars. The roof of the sinus forms the inferior component of the orbit and has the infraorbital canal running through it. The anterior sinus wall is comprised of the facial surface of the maxilla. The posterior wall is formed by the infratemporal surface of the maxilla. The medial wall is deficient posterosuperiorly to form the maxillary ostium. The hiatus is partially covered the uncinate process medially which shields the slit-like opening. The hiatus typically opens into the inferior ethmoidal infundibulum and then into the middle meatus via the semilunar hiatus. The sinus is often incompletely divided by thin septa which are rarely entirely intact. The anterior superior alveolar nerve and vessels branch from nerves at the infraorbital canal and travel into the canalis sinuosus within the anterior wall of the sinus. Ridges in the posterior wall of the sinus may be present due to the alveolar canals within, housing the posterior superior alveolar nerves and vessels to the molars. 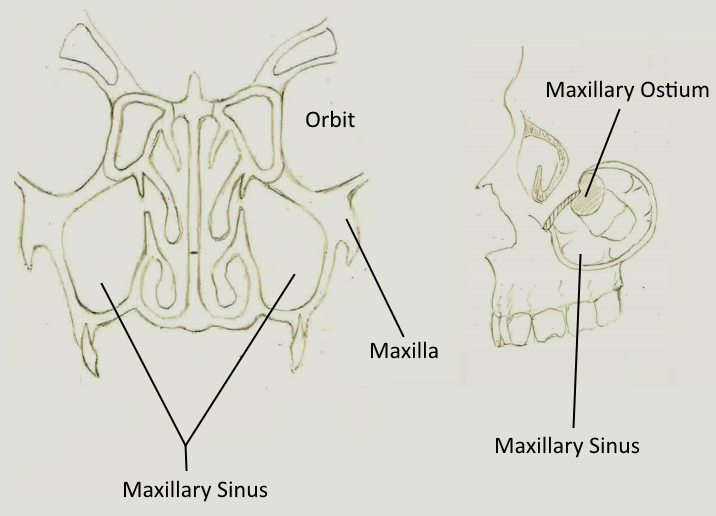 Figure 7 - The maxillary sinus in different views of the skull. Arterial supply to the maxillary sinus is primarily via maxillary arteries from the superior, middle and posterior alveolar branches and from infraorbital arteries. The venous drainage is provided by corresponding veins into the facial vein or pterygoid venous plexus. The maxillary sinus is innervated for general sensation via the infraorbital and anterior, middle, and posterior superior alveolar branches of the maxillary nerve. Parasympathetic secretomotor fibres are provided by nasal branches of the pterygopalatine ganglia. Lymphatic drainage is towards the submandibular nodes. The maxillary sinus is the largest of the 4 sinuses. The flood or the maxillary sinus is not related with the roots of the teeth. The posterior wall of the sinus is formed by the facial surface of the maxilla. The hiatus is not partially covered by the uncinate process. Both anterior superior alveolar nerves and vessels travel within the canalis sinuosus. The canalis sinuosus is within the anterior wall of the sinus. Select the statements which correctly describe the maxillary sinus. Drains into the meatus via the inferior . Arterial supply is provided by arteries from the superior, middle and posterior maxillarysupraorbitalalveolar branches and from infraorbital arteries. Venous drainage is via corresponding veins into the facialmaxillaryethmoidal vein. General sensation is provided by infraorbitalalveolarymaxillary and anterior, middle and posterior superior infraorbitalalveolarymaxillary branches of the infraorbitalalveolarymaxillary nerve. The paranasal sinuses are extensions of the nasal cavity and open into the cavity via communications (ostium) in the lateral wall. They develop during childhood and early adulthood. There are 4 in total (each in their respective bone): ethmoidal, maxillary, sphenoidal and frontal sinuses. These communications allow for balancing of air, pressure and mucous clearance. They are lined by respiratory epithelium (ciliated cuboidal) and is thinner, less vascular with less goblet cells than in the nasal cavity. Ciliary flow is directed towards the ostium and is unique to each sinus. There is a large degree of variation in the sinuses. They are all innervated by branches from the trigeminal nerve (cranial nerve V). They are the most superior sinuses and there is one on either side of the face in the frontal bone. They are located posterior to the supraorbital ridge of the skull. The frontal sinus drains via the frontonasal duct into the ethmoidal infundibulum at the middle meatus. They may be divided by incomplete osseous septa. They are averagely: 3.2 cm in height, 2.6 cm in depth and 1.8cm in breadth in adults. Arterial supply is by the anterior and supraorbital ethmoidal arteries. Venous supply is by an anastomotic vein connecting superior opthalmic and supraorbital veins. Lympahtic drainage is towards submandibular nodes. Innervation is provided by branches of supraorbital nerve from the opthalmic trigeminal branch (general sensation) and orbital branches of pterygopalatine ganglia (secretomotor). They are formed by many thin-walled chambers and sit on either side of the cribriform plate within the ethmoid. The orbital plate separates the sinuse from the orbits and the ethmoidal labyrinth separates them from the nasal cavity. They are positioned between the orbits in the superior nasal cavity. Both sinuses are dived into anterior and posterior groups (dependant on their communication). The chambers within each group are incomplete to allow communication between them. The anterior group drains into the middle meatus (via the ethmoidal infundibulum or frontonasal duct) and the posterior group drains into the superior meatus through a single canal. Arterial supply is by nasal branches of the sphenopalatine artery and the anterior and posterior ethmoidal branches of the ophthalmic artery. Venous supply is by corresponding veins. Lympahtic drainage is towards submandibular nodes (anterior group) and retropharyngeal nodes (posterior group). Innervation is provided by anterior and posterior ethmoidal branches of the ophthalmic nerves (general sensation) and orbital branches of the pterygopalatine ganglia (secretomotor). They are two large and irregularly shaped cavities within either side of the sphenoid. They are found in the superoposterior region of the nasal cavity. They communicate with the nasal cavity through an opening in their anterior wall into the sphenoethmoidal recess. May form accessory septa which divide the sinuses. The sphenoidal sinuses have relations to the cranial cavity, optic chiasm and pituitary gland superiorly, internal carotid artery and cavernous sinuses laterally and the nasal cavity inferior and anterior. They are averagely: 2 cm in height, 2.1 cm in depth and 1.8cm in breadth in adults. Arterial supply is by posterior ethmoidal branches of the ophthalmic arteries and nasal branches of sphenopalatine arteries. Venous supply is by posterior ethmoidal veins into superior ophthalmic veins. Lympahtic drainage is towards retropharyngeal nodes. Innervation is provided by posterior ethmoidal branch of ophthalmic (V1) and orbital branches of the pterygopalatine ganglion. They are within the body of the maxilla and are the largest of the sinuses. The floor of the sinus is associated with the roots of the teeth. The roof forms the inferior orbit. The anterior wall comprises the facial surface of the maxilla and the posterior all comprises the infratemporal maxilla surface. The medial wall is deficient (the maxillary hiatus) and is partially covered by the uncinate process. The hiatus opens into the inferior ethmoidal infundibulum and into the middle meatus. The anterior wall of the sinus contains the canalis sinuosus (housing the anterior superior alveolar nerves and vessels). Arterial supply is by maxillary arteries from the superior, middle and posterior alveolar branches and from infraorbital arteries. Venous supply is by corresponding veins into the facial vein or pterygoid venous plexus. Innervation is provided by infraorbital and anterior, middle, and posterior superior alveolar branches of the maxillary nerve (general sensation) and nasal branches of the pterygopalatine ganglia (secretomotor). Study the image above. Select the correct sinus that is circled in red. The orbital plate seperates the ethmoid sinuses from the nasal cavity. The floor of the maxillary sinus is associated with the roots of the teeth. 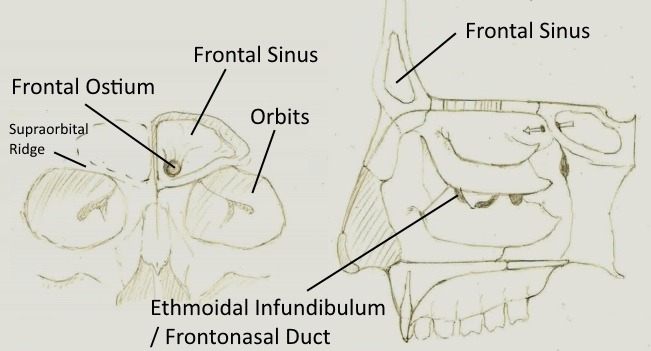 The sphenoid sinuses are found between the orbits. The frontal sinus drains via the frontonasal duct/ethmoidal infundibulum into the middle meatus. The posterior group of the ethmoid sinus drains into the superior meatus. Ciliary flow within each sinus is random and without any particular direction. The maxillary sinus is not the largest of the paranasal sinuses. The paranasal sinuses are innervated by branches of the trigeminal nerve (cranial nerve V). 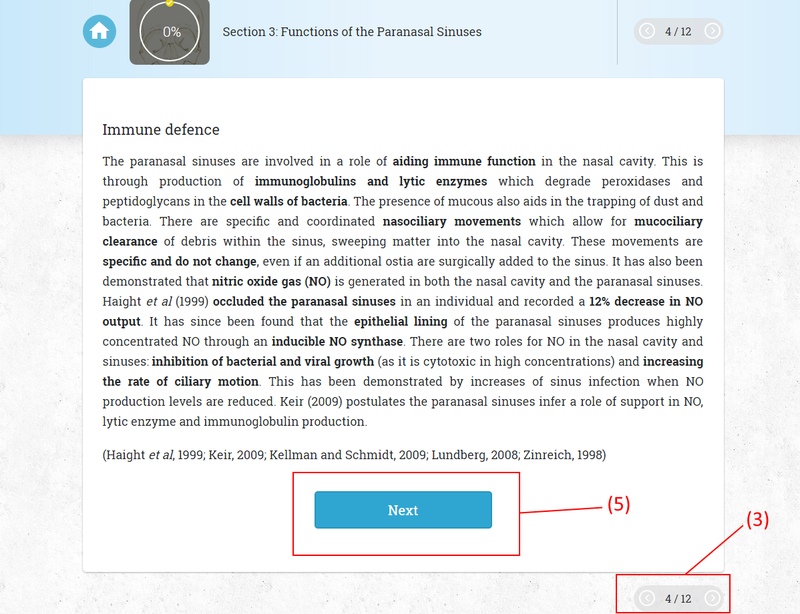 Select the statements which correctly describe the paranasal sinuses. The frontal sinus lymphatics drain towards the retropharyngealsubmandibularorbital nodes. The ethmoidal sinus has arterial supply from nasalorbitalethmoidal branches of the ethmoidalsupraorbitalsphenopalatineophthalmic artery and from anterior and posterior ethmoidalsupraorbitalsphenopalatineophthalmic branches of the ethmoidalsupraorbitalsphenopalatineophthalmic artery. Innervation (general sensation) of the maxillary sinus is provided by the and anterior, middle and posterior superior branches of the maxillary nerve. The sphenoidal sinus receives venous drainage by posterior veins into superior ophthalmic veins. Describe where the communications of the paranasal sinuses with the nasal cavity can be found on the lateral wall. Then explain why these communications exist. The functions of the paranasal sinuses (figure 1) are an area of heavy discourse among researchers and remain unclear. There has been a large diversity of speculation throughout the years, with most theories being based on personal opinion. Yet it remains thus far that no conclusive functions for the paranasal sinuses have been found, mostly due to a lack of empirical evidence. However, in recent years there has been a slowly growing pool of data which lends credibility to some theories. The most established and evidence based theories will be explored in this following section. However, it is worth keeping in consideration that a true function is still unclear. It is also likely that most functions of the paranasal sinuses are more comparable to survival benefits that have developed functionality over time. Figure 1 - An abstract depiction of the paranasal sinuses in relation with one another and the nasal cavity. The first function of the paranasal sinuses is protection of vital organs such as the eyes, brain and optic nerve through "crumple zones" of the skull (figure 2). A study by Kellman and Schmidt (2009) suggested that these crumple zones provided a survival benefit by increasing protection of these vulnerable and vital organs, thereby providing a survival benefit. This function is likely delivered through the paranasal sinuses "crumpling" during an impact force striking vital parts of the skull. Maxillary sinus - protection of the globes and optic nerves. Ethmoid sinus - protection of the globes, olfactory nerves and both anterior and middle cranial fossae. Sphenoid sinus - protection of the optic nerve, carotid arteries, cavernous sinus and pituitary gland. The facial bony architecture is known include thick buttresses in its design which strengthen the skull and disperse forces more effectively. These buttresses are surrounded by thin and non-supportive bone and are contributed to by the paranasal sinuses. Kellman and Schmidt (2009) reported that surrounding these buttresses with strong bone reduced the ability of the skull to crumple, leading to more energy being directly transmitted to the orbits and eyes. This was clear when the paranasal sinuses were removed (filled with translucent plastic bone cement); trauma delivered to the orbit would result in orbital rupture. This was not seen in control skulls with intact paranasal sinuses. With the current design of the skull, there is also a high degree of sparing of the optic nerves, orbits and viscera when high impact injuries are sustained. remain unclear and lack empirical evidence. vital anatomical features such as the orbits, brain and optic nerves. a buffer and disperse kinetic forces which decreases total impact energy on the skull. thick buttresses which strengthen the skull by dispersing forces. a reduced ability to crumple and lead to more energy being transmitted to the orbits. sparing of the optic nerves, orbits and viscera with high impact injuries. The paranasal sinuses are involved in a role of aiding immune function in the nasal cavity. This is through production of immunoglobulins and lytic enzymes which degrade peroxidases and peptidoglycans in the cell walls of bacteria. The presence of mucous also aids in the trapping of dust and bacteria. There are specific and coordinated nasociliary movements which allow for mucociliary clearance of debris within the sinus, sweeping matter into the nasal cavity. These movements are specific and do not change, even if an additional ostia are surgically added to the sinus. It has also been demonstrated that nitric oxide gas (NO) is generated in both the nasal cavity and the paranasal sinuses. Haight et al (1999) occluded the paranasal sinuses in an individual and recorded a 12% decrease in NO output. It has since been found that the epithelial lining of the paranasal sinuses produces highly concentrated NO through an inducible NO synthase. There are two roles for NO in the nasal cavity and sinuses: inhibition of bacterial and viral growth (as it is cytotoxic in high concentrations) and increasing the rate of ciliary motion. This has been demonstrated by increases of sinus infection when NO production levels are reduced. Keir (2009) postulates the paranasal sinuses infer a role of support in NO, lytic enzyme and immunoglobulin production. Nitric oxide (NO) inhibits growth of bacteria within the parnasal sinuses. Ciliary movement in the paranasal sinuses are directed towards any ostia present (natural and/or artificially added ostia). Mucous in the paranasal sinuses traps dust and other antigens. NO increases the rate of ciliary beating in the paranasal sinuses. It is possible that the paranasal sinuses play a role in the quality of the human voice and the resonance of voice. The maxillary sinus was particularly important due to its large size (figure 3). It is also possible that the sinuses aid the voice changes occurring at puberty as the sinuses develop in the skull around this time. The involvement of the sinuses was demonstrated by Ungor et al​ (2013) who studied sinus lift surgery, a procedure which adds a bone to the upper jaw, on the patients voice. Sinus lifts have been shown to reduce sinus volume as the pre-prosthetic sinus floor is elevated. The study showed that post-operative volumes of the maxillary sinus in particular were significantly reduced (by 17.8%). This reduction in sinus volume was associated with changes in voice resonance and therefore a reduction in voice quality. It is possible that this is a static consequence of the paranasal sinuses instead of offering any survival benefits. This theory has been challenged by some studies with contrary results, finding inconsistencies which may make the sinuses poor resonators such as limited osita sizes and the ostia being covered by the conchae. Some studies also found little to no effect on voice post-sinus surgery. Figure 3 - The maxillary sinus from different views of the skull. Coronal section (left) and an external view (right). Sinus lift surgery resulted in a increasedecrease of the total sinus volume. This was due to a/an elevationreduction in the floor of the sinus. Changes to the sinus volume resulted in alteration of voice resonance and a subsequent increasedecrease in voice quality for patients. The sinus is of particular importance due to its large size. The sinuses may be partially responsible for voice changes occuring at . There is a common belief that the sinuses allow for facial bone increases during growth without a corresponding mass increase, aiding balance of the head. However, several papers have demonstrated that these mass changes are mostly negligible and would only result in an additional 1% of weight approximately if they were instead filled by cancellous bone. An electromyographic study of the neck musculature in response to anterior loading of the head also demonstrated that the extra weight is unlikely to have been significant enough to warrant sinus development. Air exchange has been demonstrated to occur in the paranasal sinuses during respiration and it is thought that they help regulate temperature and humidity of inhaled air. However, there is doubt on this theory due to the amount of exchange being low and with exchange times exceeding 5 minutes during normal breathing. There have been a large variety of other theorized functions, but the majority have not been included based on their dismissal. For example: increasing olfactory areas and mucous secretion areas. The functions of the paranasal sinuses remain unclear and are subject to extensive debate. A slowly growing pool of data is lending some credibility to several theories. Crumple zones allow for effective extra protection of the orbits and neurocranium. Crumple zones provide dispersion of kinetic energy and buffer the distance to travel to allow for deceleration - reducing the total impact energies. The facial architecture has anatomical buttresses which strengthen the skull and disperse forces. These buttresses are surrounded by areas of thinner bone and are contributed to by the paranasal sinuses. The thin bone allows the facial skull to crumple and disperse forces without direct transmittance to the eyes and brain. Removing the paranasal sinuses reduced the skulls ability to crumple, resulting in orbital rupture. The paranasal sinuses produce immunoglobulins and lytic enzymes which aid in degrading bacterial cell walls. Specific and coordinated nasociliary movements allow for mucociliary clearance of the sinus. Nitric oxide (NO) is also produced in the sinuses which inhibits bacterial growth and increases rate of ciliary movement. Reduced volume of the paranasal sinuses effected resonance of voice and voice quality in patients after sinus lift procedures. The maxillary sinus is of particular importance with its large size. Sinus development during puberty is likely involved with the alteration of voice. The paranasal sinuses may be involved in allowing skull growth without associated mass increases. Some papers have demonstrated this weight reduction may be negligible. The paranasal sinuses may also aid in humidity and temperature regulation of inspired air. The exchange of air in the sinuses may not be enough to validate this theory. What functions does nitric oxide production in the paranasal sinuses provide? The maxillary sinus is particularly important in voice resonance due to its small sizelateral positionlarge sizemedial position . The paranasal sinuses likely are involved in the which occurs during puberty. A large reduction in the volume of a paranasal sinus results in a reductionimprovement of voice resonance and therefore quality of voice. A contrary theory believes that the limited size of the and the presence of prevent any meaningful voice resonance. Which vital area is believed to be protected from trauma by the frontal sinus? Explain the following functions of the paranasal sinuses in your own words: paranasal sinuses as crumple zones, immune defence and quality of voice.